FIGURE 5-9 Oligosaccharide chains of thyroid-stimulating hormone (TSH). 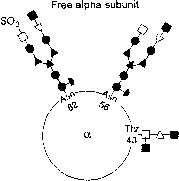 Schematic representation of the typical oligosaccharide chains present on the TSH heterodimer and the free a-subunit. Glycosylated asparagine (Asp) and threonine (Thr) residues are indicated. 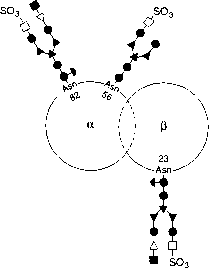 Black and white circles, half-circles, and triangles represent the oligosaccharide chain residues as indicated in the key. Reproduced with permission from Sarapura, V. D., Samuels, M. H., and Ridgway, C. E., (1995). Thyroid-stimulating hormone. In "The Pituitary" (S. Melmed, ed. ), pp. 187-229. Blackwell Science, Oxford.